1/2 Price: 16-17 Seasonal Balancing Solution - Perelandra Ltd. While seasonal microbial activity is sporadic across much of the northern hemisphere, there are still pockets of regional activity and other concerns. Also, this is the time of year when seasonal activity begins to ramp up in much of the southern hemisphere. Because of the unpredictability of microbial activity, and in light of what this year's Solution addresses, it's best to continue to take your Seasonal Balancing Solution twice daily through the end of this year's cycle (August 2017). 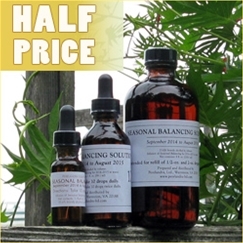 All Seasonal Balancing Solution for this season is now half price. Includes 1/2-oz. and 2-oz. dropper bottles, and 8-oz. refill bottles. Available while supplies last. Retail only. No additional discounts. Bottle Buyers Club Savings: Free U.S. Shipping ($15 off int'l). The current Seasonal Balancing Solution will address seasonal issues from August 2016 through August 2017. It may be effectively used by anyone living anywhere around the globe. Seasonal microbial activity often flares up in the fall and winter, but these days there are pockets of high activity flaring year-round. It helps to give your body time to build up by starting to take the Solution before there are issues in your area. We recommend you start taking the Seasonal Solution as soon as you receive your order, and continue to take it throughout the year. • People around you keep saying "gesundheit"
• You have concerns about what comes out of Rio, Puerto Rico, Florida . . .
One dose of the 2016-2017 Seasonal Balancing Solution is 10 drops. When taken twice daily, a 2-oz. bottle will last about 2 months. And this year, because of the mix of microbial issues out there, we strongly recommend the twice daily dosage. If you're taking this Solution on its own, you can take it anytime in the morning and anytime in the evening. Don't eat or drink 15 minutes before or after. 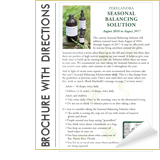 Following that same timing, you can also take Seasonal Balancing with these other Perelandra Solutions: Weight Balancing, Energy Balancing and Stabilizing, Joint Health, Human Internal Parasites, Human External Parasites. At bedtime (last thing at night): Wait 15 minutes after you finish eating, drinking and brushing your teeth. Take Seasonal first and then take the MBP Solutions in whatever order you wish. When you wake up (first thing in the morning): Take your MBP Solutions, then take Seasonal last. Wait 20 minutes before you eat, drink or brush your teeth. Whenever you're taking multiple Solutions at the same time, always wait about 10 seconds between each Solution. Starting tomorrow, August 5th, and running through Sunday, August 21st, all eyes will be on the Rio Olympics. Unfortunately hundreds of thousands of people (athletes, trainers, support teams, family members, friends and Olympic-loving tourists) will be doing more than watching from afar. Currently Brazil presents a whole host of assorted health threats and these people will be there in the midst of it. You know there are problems when athletes are refusing to attend these Olympics and are being warned by doctors to keep their mouths closed while competing in feces-infested water. Testing has shown that this water includes a high level of super bugs — bacteria that can not be treated with any currently existing antibiotics. Now picture all these people who have been exposed to pathogens in one way or another leaving Brazil on August 21st and 22nd en masse and spreading out around the world as they return to their homes. You don't need to be infected to spread pathogens. Microbes are brilliant when it comes to moving around. They can travel on clothes, shoes, skin, hair, in and on suitcases, tickets, passports, money, souvenirs and equipment. And they can travel in and on planes, trains, buses and cars. You don't need to be living next door to an Olympic athlete or Rio traveller to experience exposure. Keep reminding yourself that microbes really know how to travel around. No one knows what's going to happen when everyone leaves Rio all at once but I get the feeling everyone (including the CDC and WHO) is holding their breath and hoping the world escapes a major disaster. When considering what we at Perelandra can do to address this potential disaster, I realized that everything that could come out of Rio at this time falls under the category of "seasonal." So this year, our annual Seasonal Balancing Solution pattern that addresses the regular collection of seasonal discomforts we deal with has also taken Rio into consideration. And our staff is taking Rio into consideration. We are not waiting until September 1st to begin shipping the new 2016-17 Seasonal Balancing Solution. Instead, we are producing the tincture, bottling and preparing for shipping right now so that we can get your order to you as soon as possible. We are still offering the regular, annual August "preorder" sale, but in light of these Rio changes we will be shipping the bottles to you as quickly as possible. I recommend that as soon as you receive your order you begin taking the Seasonal Solution. This way when the mass exodus occurs on August 21st, you will have already begun to build strength against possible exposure. This Solution has been created by Machaelle Wright and nature from a combination of electrical infusions from different plants, minerals, natural gases and elements found in the atmosphere, sea and on land. It contains water, a specific electrical pattern and a preservative (brandy or distilled white vinegar). It is a safe and natural oral solution that may be taken by adults, pregnant women and children. Thank you, thank you, thank you! If not for this, I probably would have had a sore throat for far longer than the short gap of time between when the 2014–2015 Seasonal Balancing Solution ended its effectiveness and when the 2015–2016 SBS was delivered. Within a few days, my nasty symptoms went away, and I recovered from the syndrome that was affecting others in my family, as well. Please continue your excellent research and work on this product!